The numerous opportunities to participate in service provided through Church of the Holy Spirit are provided through the lens of our Catholic faith. Paprocki emphasizes that, “Followers of Jesus serve others to make the Kingdom of God visible to those on the brink of despair. † We do service to bring hope to others. 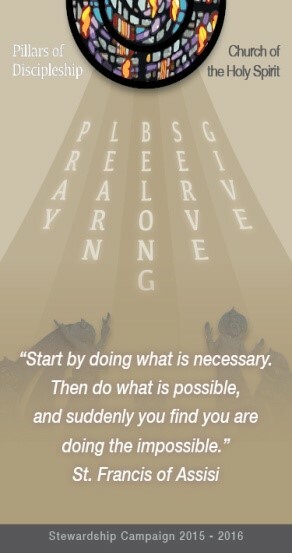 † We do service to bring glory to God. We do not perform good works in order to please or assuage God. We do not do good works in order to earn grace or salvation. At Church of the Holy Spirit, we believe that it is imperative to help participants – adults and children see their participation in service experiences within the context of faith. The “great commission” from the Gospel of Matthew, “Go and make disciples of all nations” serves as the foundation for all we do. At Church of the Holy Spirit, we believe that there are five pillars to being a good disciple and in forming others to become good disciples. The SERVE pillar is the fruit witnessed in the lives of prayerful, informed and responsible disciples. Our parish St. Vincent de Paul ministry is a lay team of men and women who join together to grow spiritually through Christian service. They offer person-to-person service to families and individuals living within our parish area who are in need of groceries and financial assistance. This ministry serves as a witness to God’s love by embracing works of charity and justice. They collaborate with other people of good will in relieving need and addressing its causes. They make no distinction in those served because, in them, our parish sees the face of Christ. St. Vincent de Paul assists people in our parish needing food, clothes, rent assistance, utility assistance and other emergency needs. A special collection on the first Sunday of the month helps to support the St. Vincent de Paul ministry. Your donations help many families each month to stay in their homes and feed their families. Services are available Monday through Friday, 9:00am to 12:00pm, on a first come first serve basis. Contact the parish St. Vincent de Paul Office at  344-0611 to receive assistance or for information about joining this ministry. Our parish Faith in Action Committee [F.I.A.C.] is a lay team of men and women who join together to sponsor many of the social outreach projects in the parish as well as promote civic responsibility and participation in government activism. Projects include Habitat for Humanity, Meals on Wheels, Catholic Worker House support, and the Giving Trees at both Christmas and in July. FIAC provides information regarding pending legislation and government action on the state and local level, particularly as it affects the Church’s mission for social justice. Take the opportunity to make a difference in city and state issues. Holy Spirit Parish has been an annual house sponsor for Habitat for Humanity since 1998. Our parishioners participate in the Spring Builds as “square foot” sponsors to raise the money needed to fund the building. Volunteers also serve in construction, painting, landscaping, etc., as well as preparing and serving meals to the work crews. Holy Spirit Parish has a dedicated group of volunteers who assist the Meals on Wheels of San Antonio to distribute meals to homebound seniors Monday through Friday each week. Hot meals are prepared at the Meals on Wheels central kitchen, transported to Holy Spirit, and then delivered by our volunteers to residents who live in our area. If you are interested in receiving more information or if you wish to volunteer for one of our Christian Service programs, please contact one of our service leaders by visiting our Parish Contacts page.